The prerequisite for a good day? A good night's sleep. 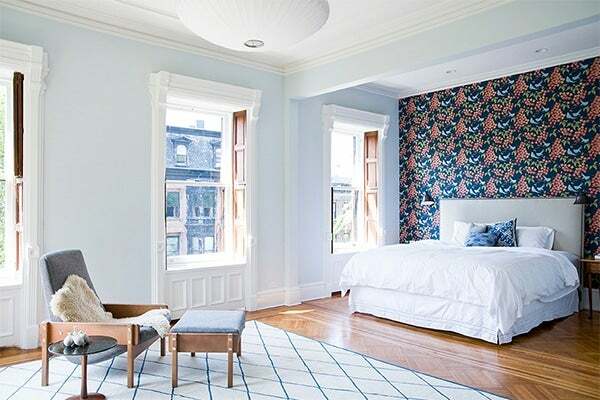 To make your slumber as stylish as possible, we've created a gallery of 22 cozy, serene and dream-worthy bedrooms. 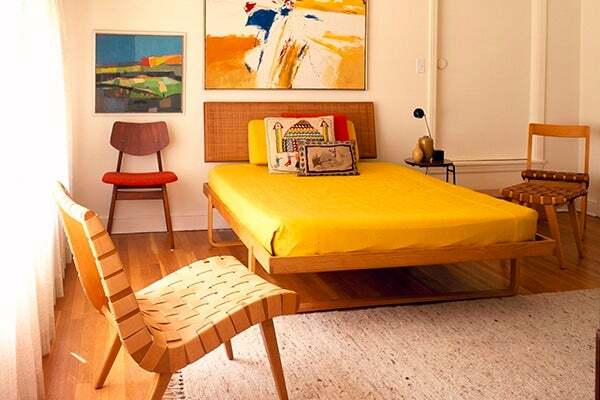 Architect Michael Haverland’s East Hampton bedroom deftly mixes 20th-century classics — including a Harvey Prober headboard, a Yngve Ekstrom armchair and a Frank Gehry cardboard Wiggle chair — with a stunning, floor-to-ceiling southern exposure. A bedroom in the New Canaan, Connecticut home of furniture designer Jens Risom is filled with his signature lattice-woven chairs. Photo by Matthew Hranek/Art + Commerce. 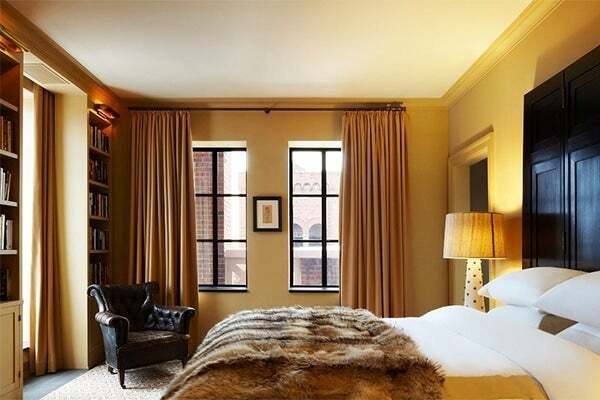 Gently worn leather and exposed wood beams lend an air of rustic comfort to this bedroom in designer Estee Stanley’s Los Angeles home. 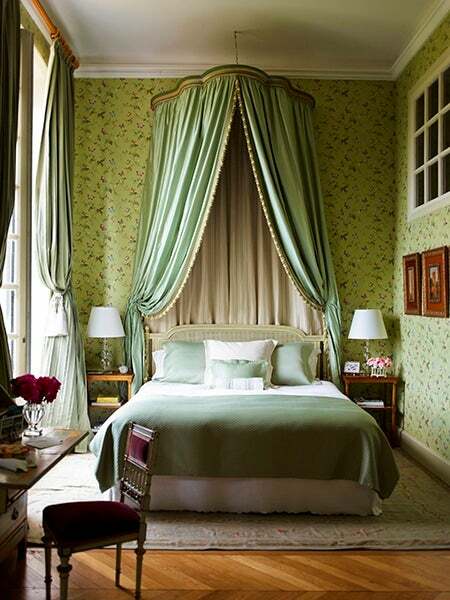 Waverly wallpaper, a Schumacher fabric canopy and an Aubusson carpet create a serene, nature-inspired tableau in a guest bedroom of interior designer Timothy Corrigan’s Loire Valley estate, Château du Grand-Lucé. 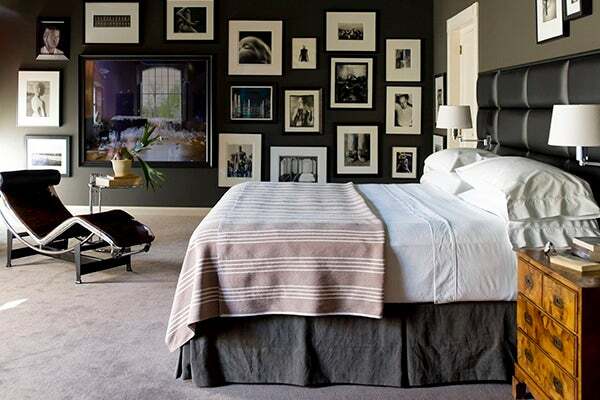 Artworks by Helmut Newton and Chuck Close hang above a Le Corbusier chaise lounge and an Eileen Gray side table in the master bedroom of this Dutch country home. 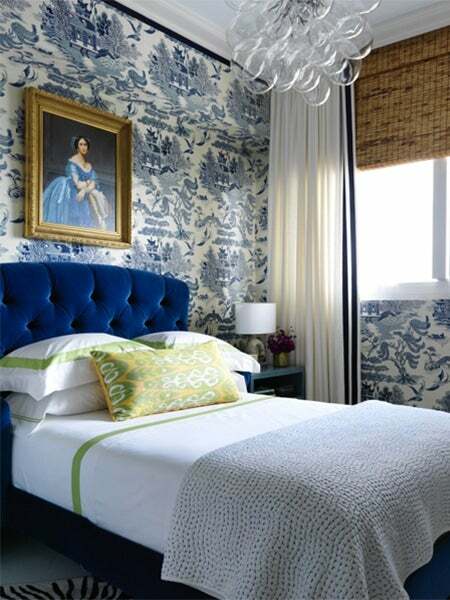 In this Miami bedroom, interior designer Robert Passal matched a hand-screened Cole & Sons wall covering to a custom velvet headboard. 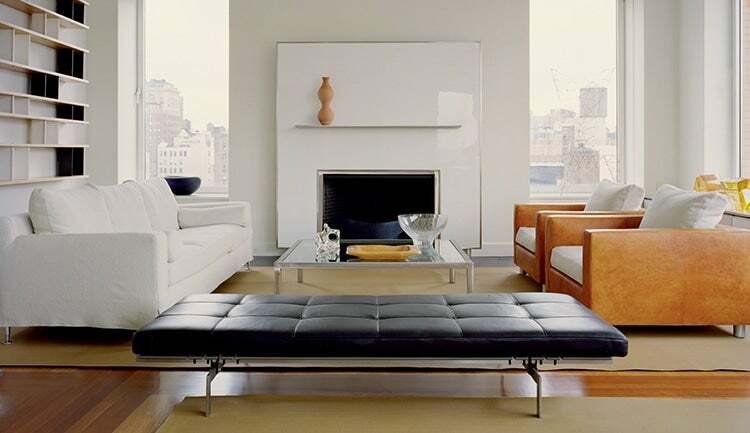 For a New York City show house, Caleb Anderson designed a steel canopy bed with a cantilevered footboard that doubled as a desk. 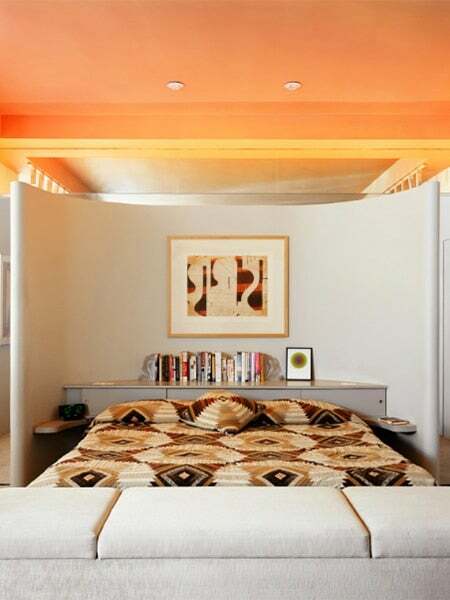 In this modern, minimalist Manhattan apartment designed by architect Paul Rudolph, a tapestry-covered bed is tucked inside a gently curved wall. Photo by Anthony Cotsifas/Art Partner. 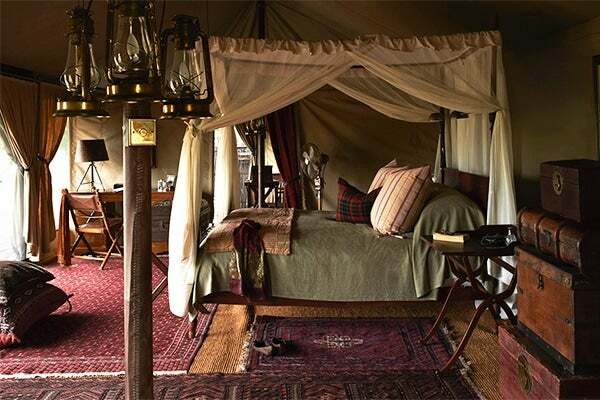 South African designer Boyd Ferguson created this contemporary paean to the hunting camps of the 1920s. For this Kona, Hawaii retreat, decorator Nicole Hollis designed a custom bed, bench and pair of side tables. 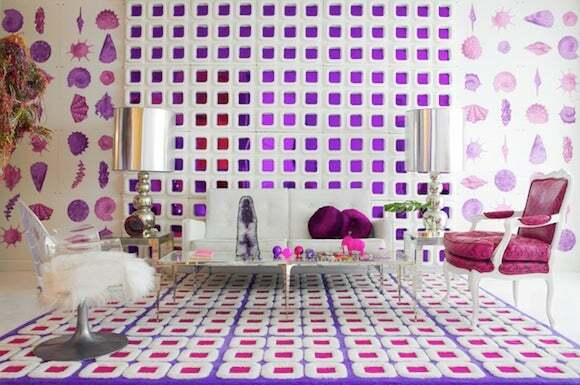 The pieces were inspired by the volcanic landscape surrounding the home. 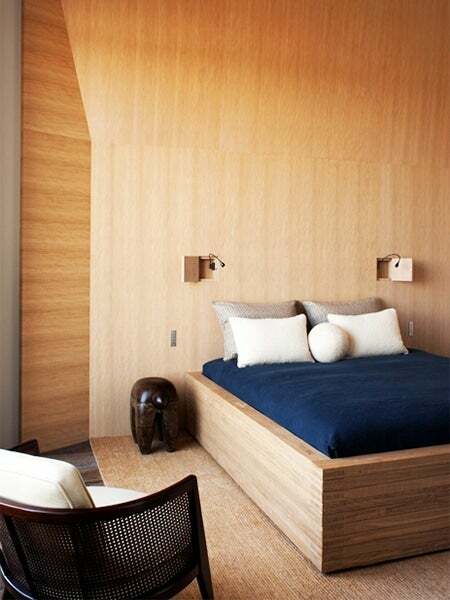 Damien Langlois-Meurinne used softly rippling spruce-wood veneer to cover the walls of this creamy, etheral Paris bedroom. Photo by Stephan Julliard/Tripod Agency. 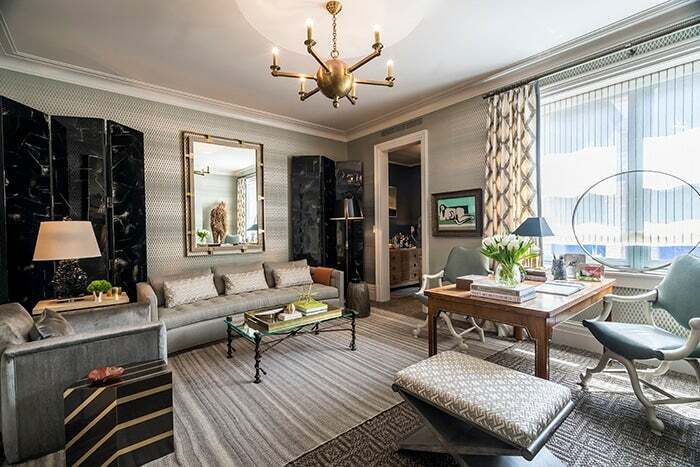 Using a palette of grays, creams and icy blue, French decorator and architect Jean-Louis Denoit accents this Paris pied-à-terre with a Pouenat chandelier and 1960s armchair. Photo by Xavier Bejot, courtesy of Rizzoli. 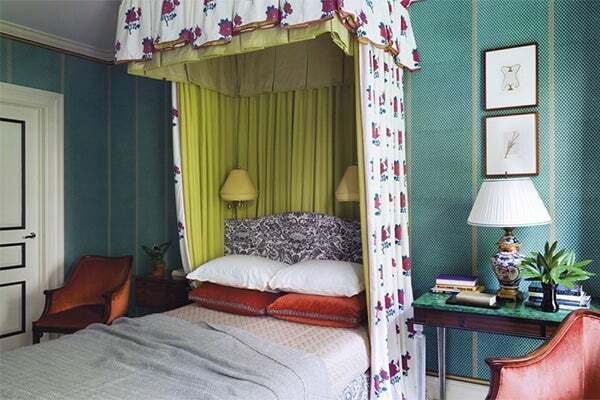 Jeffery Bilhuber’s colorful vision for this New York City bedroom combines an acid-green bed corona, a malachite-topped side table and patterned teal cloth wall coverings. Photo by William Abranowicz, courtesy of Rizzoli. 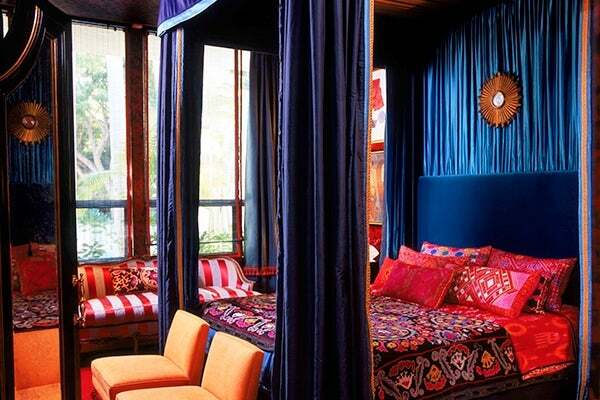 Interior designer Kelly Wearstler used saturated jewel tones and a mix of exotically patterned textiles in the guest room of her former Beverly Hills home. 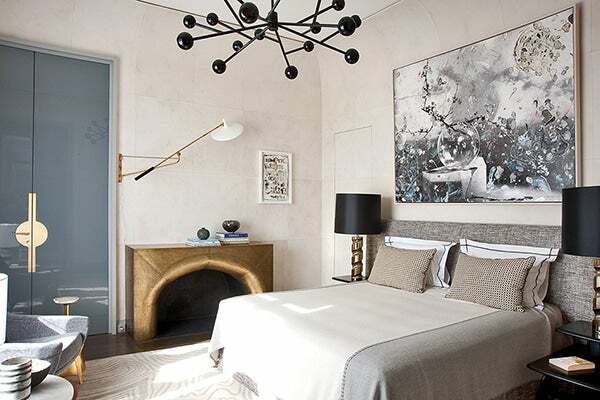 Photo courtesy of Kelly Wearstler, Inc.
After sundown, the ample natural light in this Brooklyn bedroom — designed by architect Elizabeth Roberts — is replaced by the soft glow of a George Nelson pendant. 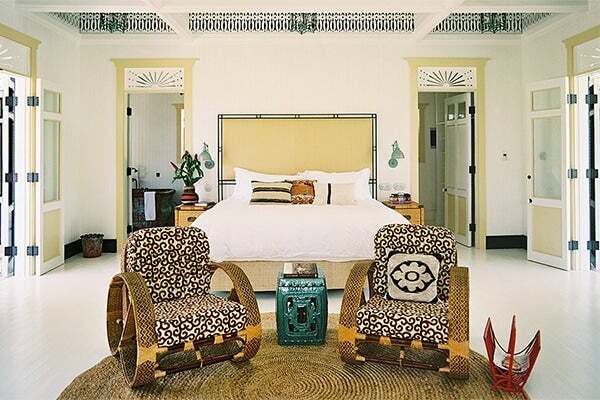 At the Celerie Kemble-designed Playa Grande Beach Club in the Dominican Republic, the bedroom of one bungalow mixes crisp black and white linens with organic pieces like a pair of braided-rattan armchairs. 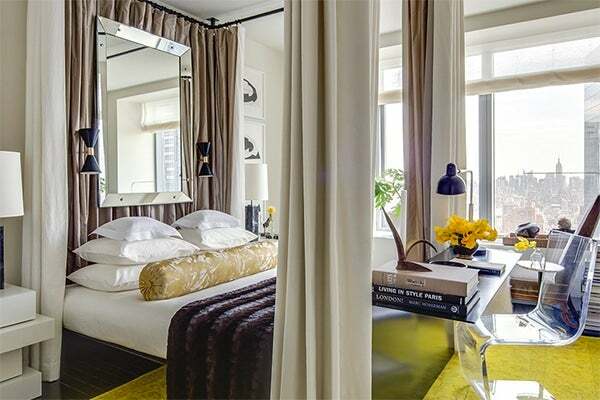 Design firm Janson Goldstein used a David Hicks rug, vintage leather club chair and oversize fur throw to create a luxe, laid-back master bedroom in this New York City penthouse. 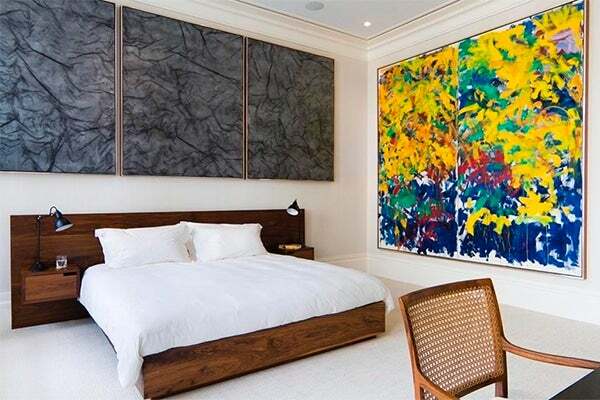 Design duo Ashe + Leandro hung paintings by Rudolf Stingel and Joan Mitchell in the New York City bedroom of an art collector client. Photo courtesy Ashe + Leandro. 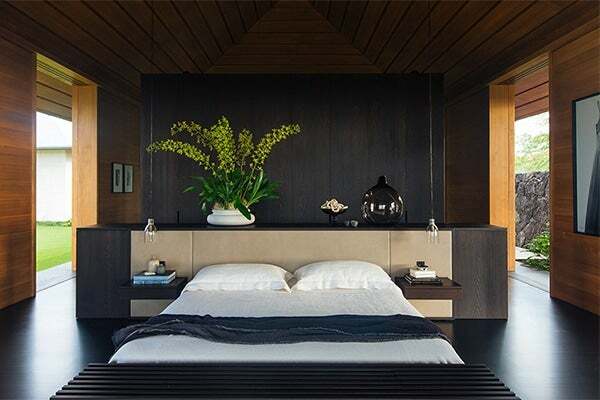 Designer and architect Pierre Yovanovitch used sandblasted oak paneling to clad the walls of his Paris bedroom, and designed the matching oak bed and concrete bedside table. 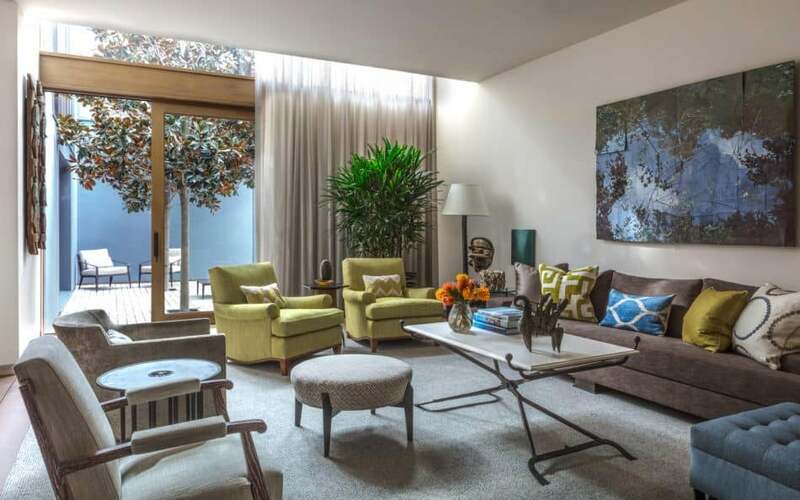 A 1960s armchair by Harvey Probber sits in the foreground of the room. 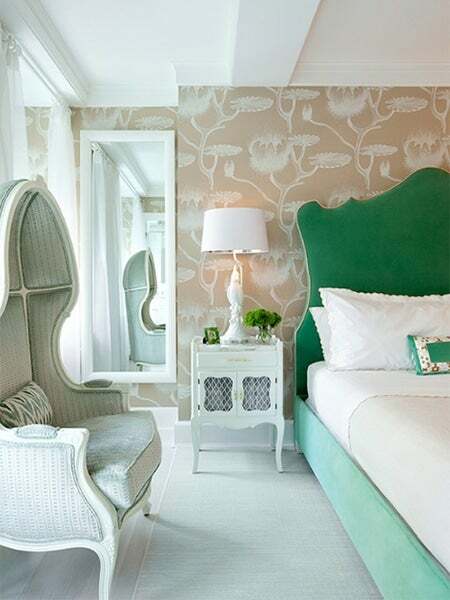 Interior designer Fawn Galli designed this whimsical, sorbet-colored bedroom — which includes a headboard of her own design — for a New York City client. 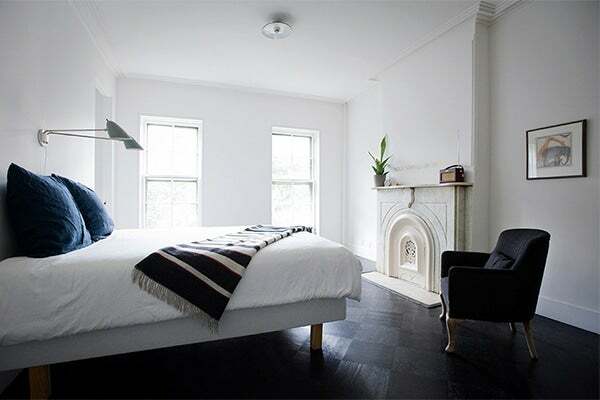 Architect and designer Elizabeth Roberts used a David Weeks sconce, a Missoni throw blanket and an armchair upholstered in men’s suiting fabric to create this beautifully pared-down bedroom in her Brooklyn home. 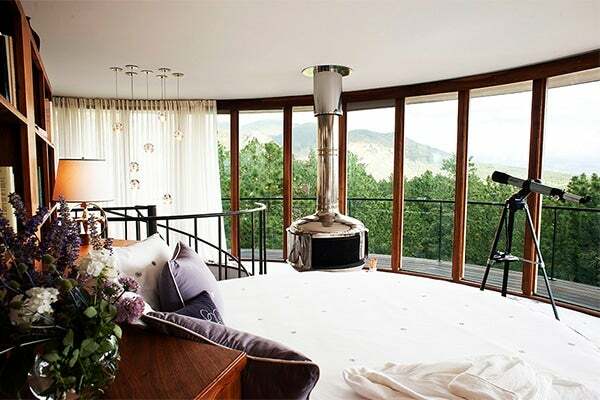 Round House, the aptly named Colorado Springs residence of designer Emily Summers, makes use of a circular bed original to the home’s 1968 architecture.